It's Christmas Eve and I'm blogging. What the heck? This year is a repeat of last Christmas Eve. The girls are with Alyssa's dad, celebrating the holiday with her grandparents. Joe's sleeping and working, as he works the entire holiday week. He'll be working tonight, and Christmas night as well. So I'm just hanging out at the house, wrapping a few gifts, making a few last gifts, and watching Christmas movies. So I figured I would pop in here really quick and share a last minute holiday card idea. It's not too late to throw something together, as I just did this yesterday. A bit part of the reason that I fail so miserable at sending out Christmas cards is that I don't always have a good photo to use. With the girls being older, I hardly get any photos of them throughout the year to begin with. So I don't usually have photos on hand to pull together for a fun little photo collage or something. And the only time we seem to get a family photo is when we get together for Christmas. There's always seems to be too much going on in life, that we just put off getting a photo taken for a card, and then before you know it, it's just too late. The girls went to Magic Mountain (a big amusement park a few hours from here) last weekend, and when I saw this photo they took, I knew it would solve my problem. It's not what I might typically use for a Christmas card, but I thought it was a super cute photo and I figured it was a guaranteed way for me to get a card made to send out this year. I browsed the designs online at Costco, which is where I normally order my cards, but didn't see anything that I cared for and that would work well with my photo. I've designed my own Christmas cards before, so I knew it would be super easy to do again. 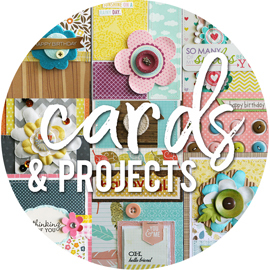 I dug through my kits from Kerri Bradford Designs, looking for designs I could incorporate into my card design. 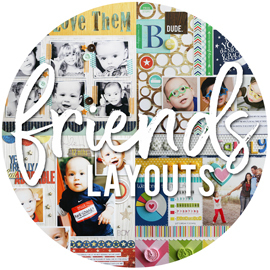 When you purchase Kerri's kits, you get her designs as PNG files as well as the cut files. The PNG files can be used digitally, which gives you more ways to incorporate them into projects. I didn't start out with all of these picked out when I started. But they're all the pieces I ended up with, including the digital stitches and staple that I pulled from my stash of digital kits. I started with a sentiment from the Merry Everything kit. I actually started with "Merry Christmas", but since I won't even be mailing these out until after Christmas, I decided to go with the "Merry Everything" instead. I just think it's a cute little sentiment. The PNG's will often be certain colors (or the standard black) once you pull them into Photoshop. But you can easily change them to whatever color you need by using the "color overlay" option. I went with a dark aqua to go with the ornaments on the trees. I also added a little drop shadow to the sentiment. I thought the dotted overlay from the Magicalness kit would be fun to use over the entire photo. I layered it onto the "background" layer, so that the sentiment was still on the top layer (otherwise, the title would have been covered by the dots). I didn't want the dots to cover up the girls, so I used the rectangular marquee tool to select any of the dots that I wanted to remove, and simply deleted them. I also changed the opacity (down to about 82%) so that the dots were a little more subtle. I knew I wanted to add a little something to the side of the photo, and that I needed to incorporate a little red into the design. I pulled up the red dotted card from the Hello December kit, and selected just a small strip of it to add along the right edge of the photo (I turned the image here, just so that it fit better on the screen). I sized it to fit, and then changed the opacity so that it had a clearer look to it. Kind of gives a washi tape look to it, right? I pulled up one of my digital zigzag stitches in grey, and added that along the edge of the red dotted paper, to give it a more finished look. The upper left corner needed a little something, so I pulled up this cute little tag from the Attach It kit and resized it to fit along the edge of the photo. I changed the opacity on the tag as well, just as I did on the overlay and the red dotted paper. The tag starts out yellow, but I changed it to the same dark aqua color that I made my sentiment. It's easy to make things the same exact colors, when you use the color code # that comes up once you pick your color. You just copy that color code # into the box on your next item, and it uses the same color. I used the text tool to add a secondary little sentiment and our names. This is the font that just popped up when I started typing, so I just went with it. The fewer decisions I had to make on this, the quicker I got it done. The little hole in the tag neeed something, so I added two small digital staples. And ta-da, the finished card. I spent about half an hour on this, and put my order right into Costco. No overthinking on this, and it feels good to know that after a two year break, I can finally sent out some cards again to family and friends. They might not arrive until after New Year's, but that's more than ok with me! And with that, I want to wish you all a very merry Christmas! May your time spent with family and friends this Christmas holiday be magical and full of great memories. 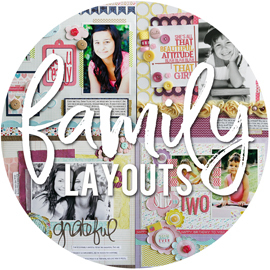 I have another little project up over at Kerri Bradford Studio today. Now that my girls are older, along with my nieces, I tend to give a lot of gift cards at Christmastime. So I'm always looking for fun ways to give them. When I saw the cute little pinked petal envelope in Kerri's Santa's Workshop: Toys Only kit, I pictured it paired up with the Confetti kit to create a fun shaker envelope. I cut the envelope from some tone-on-tone patterned paper (all patterned papers are from Simply Stories), picking a lighter color so that the other elements would stand out against it. I cut a piece of a transparency just slightly smaller then the size of the envelope and machine stitched it to the front of the envelope, leaving one side open. This shows the backside of the envelope, which is really the inside of the envelope once you open it up. When I went to photograph this, I didn't have anything to hold the flaps down, so I don't have a picture of it closed. Once I jot down my message on the inside and add the gift card, I will fold down the flaps and secure them with a sticker or some washi tape. I used Kerri's Confetti kit to cut pieces of confetti from two different patterned papers and then dropped them into the "pocket" I had created with the transparency. I added in some red, green, and silver sequins before sewing the last side of the transparency closed. I hope you've been visiting the Scrapbook & Cards Today blog for the last week and a half, to check out their 12 Day of Holiday Giving celebration! Each and every day, for 12 full days, they are sharing holiday project ideas from the design team and hosting some amazing giveaways from their generous sponsors! And TODAY is my turn to share! When I sit down to create Christmas cards, I love to come up with designs that are simple, quick, and easy to mass produce. I use this same concept when I create birthday cards, since I use so many of them. I also love to keep my cards fairly flat, so that they don't require any extra postage or special handling when mailing off to family and friends. If I happen to create more elaborate or bulky designs, I save those for the ones that I personally hand out. These cards took no time at all to put together. I chose a sentiment and a scalloped border to die cut using my Silhouette Cameo, and arranged them on my cutting mat so that I could cut multiple sets at once. I used three different strips of patterned paper on my mat, lining them up so that I cut 2 sets (a sentiment and a border) from each paper. If you were doing a large amount of cards, you could even cut all 6 sets from the same patterned paper, and then repeat for your other paper choices. I also cut the "merry" part of my sentiment from a black chalkboard patterned paper (arranging as many as needed on my cutting mat), which was layered over the original sentiment cut. Once my pieces were cut, it was just a matter of adhering them to my cards. I adhered two thin coordinating strips of patterned paper along the bottom of each card base, which I also lightly spritzed with misting spray in coordinating colors. I adhered my scalloped border die cuts to each card, matching the color of my border to the color of misting spray on each card base. Then I decided which color sentiment I wanted on each card, and adhered those in place. A little machine stitching and I was finished. I mentioned there is a new giveaway every single day, right? And I said they were amazing giveaways, right? Today, for the day 10 giveaway, there is a generous prize package from both Stampin' Up and Gossamer Blue! Head over HERE to get all the details and leave a comment to be entered in the giveaway. You have until 6:00pm EST on Sunday, December 21st to enter in all of the giveaways. So if you're just now hearing about Scrapbook & Cards Today's 12 Days of Holiday Giving celebration, you can still go back and check out the first 9 days and get in on those giveaways as well! It's the second Tuesday of the month, which means that it's time for another step-by-step monthly project sheet from Bella Blvd. The December project sheet is up, featuring the Christmas Cheer collection. 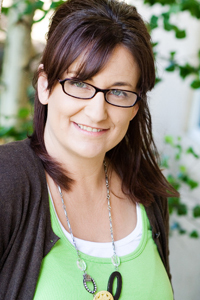 I borrowed some adorable photos taken by my good friend Krista Lund. She always sets up the cutest backdrops for taking holiday photos of her kiddos. I wish I could have left the entire backdrop she created in one of these pictures, as it was just gorgeous. But I felt like I needed to crop in more, to capture the cuteness of her children. For someone that doesn't really have an easy time scrapping Christmas layouts, I think I pulled this one off pretty well. I did pull in two patterned papers from other collections for this layout. The first was this black dotted paper, from the Halloween Magic collection, as I wanted to add a touch of black to help the other colors "pop" and the photos had some black in the background as well. I had printed my photos out before really coming up with a page design. I had printed the main photo as a 4x6" (but later re-printed it as a 3.5x5" photo), and then printed two photos at 2x3" and two photos at 2.5x2.5". This ended up working out really well, as I adhered the smaller photos to two narrow strips of patterned paper, and then added some little embellishments along with them. The second patterned paper that is not from the Christmas Cheer collection is grey dotted patterned paper. It's from the Scattered Sprinkles collection, and I picked it to add a light, neutral backdrop for my title. I also lightly spritzed it with some black misting spray, to tie in a bit more black. For my title, I used a mix of alpha stickers and the word "celebrate" which I hand cut out of a sheet of patterned paper. I really detest fussy cutting, but I'm totally willing to do it for these fun little words. I knew I wasn't adding any journaling (other than the kids names and the year), so I needed a little something to fill up that bottom right corner. I cut a few strips of patterned papers, and made little notches in the bottoms to create banners. I layered them together and tucked them under the main photo. 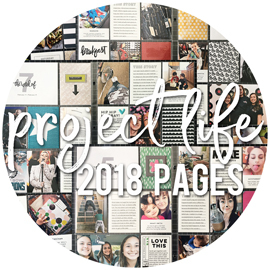 You can download the December project sheet, which features a complete supply list and step-by-step directions, RIGHT HERE. It’s that time of year again. 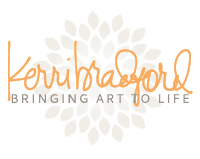 The Twelve Days of Christmas celebration started over at Kerri Bradford Studio yesterday. There’s a ton of good stuff happening over those twelve days. Fun ideas, giveaways, guests and the ever popular one-day only freebie! You never know what each day will bring, so you don’t want to miss a day! 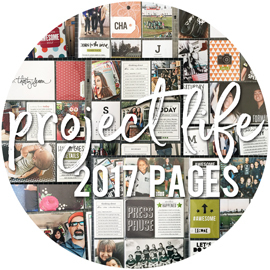 I created two different projects for our celebration, and the first one is up today. I came across a cute wooden Christmas tree on Pinterest (original project can be seen HERE), and asked Kerri if she could create something similar as a cut file. I knew it would make a great design to use on Christmas cards, although I'm also picturing it being used to create a fun wall décor piece. I knew I wanted to keep my cards fairly flat, so they would be easier to mail. I also love creating cards that can be mass produced, and this was one of those. I created eight of these cards in one sitting, two of each color. I chose a few papers in the colors you'll see in my home when it comes to decorating for the holidays. Green, red, pink, and aqua. I cut several sets from each color at once, cutting the dotted part of the tree from the patterned papers and the solid backsides from white cardstock. For the base of my cards, I cut pieces of white cardstock just slightly smaller than my card and embossed them using a snowflake embossing folder. I spritzed each one with coordinating colors of misting spray, and did some machine stitching around the edges. Then I started piecing together my trees. I started by adhering all of the dotted patterned paper pieces to the solid white cardstock pieces. I had cut the tree trunks from a black dotted patterned paper and once I adhered those to the card, I adhered the rest of the pieces and added a yellow star at the top. For my sentiment, I die cut the word "joy", taken from Kerri's Just Because kit, from the same black patterned paper that I cut my tree trunks from. I used tiny alpha stickers, from Jillibean Soup and Lily Bee, to add the "christmas".